The Japanese card of the day is Miru Biru, a Royal Paladin Common from V-BT01: UNITE! TEAM Q4! CONT [Rearguard Circle]: If it is in the same column as the vanguard, this unit gets Power+5000. 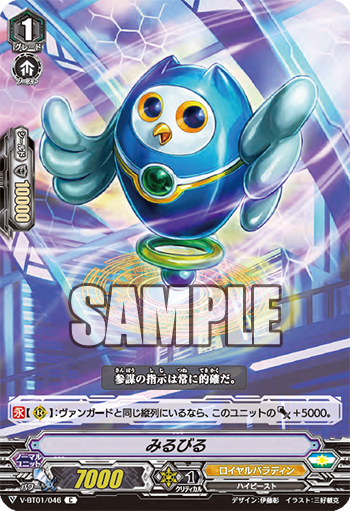 As he stands now, Miru Biru is essentially a version of Wingal that doesn't count towards the 4-card maximum, so you could run 4 copies of Trial Deck Wingal and still get the functionality of Start Deck Wingal from Miru Biru. 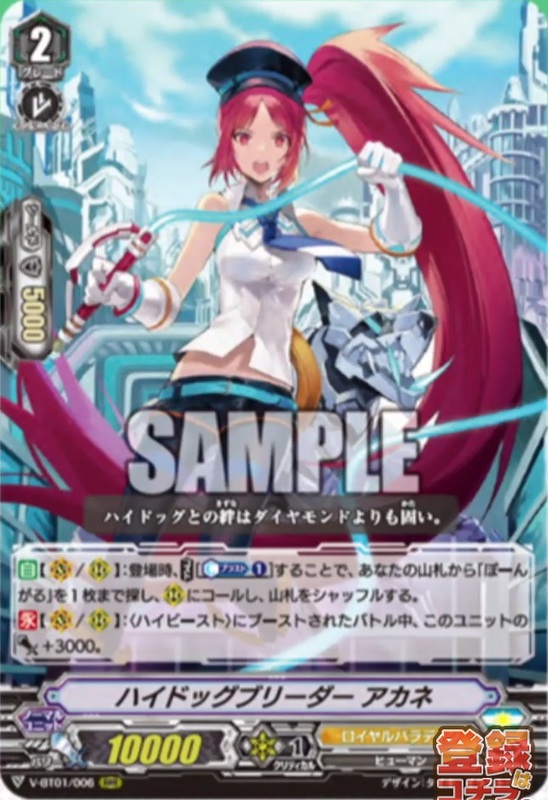 Also of note is that Miru Biru is the first non-Start Deck grade 1 we've seen to be a 7k base, something that is demonstrably not the standard for Standard. Whether you run Miru Biru at all is largely personal preference; with the 13k base grade 3s he forms a 25k column, which is just over a desirable 23k threshold most grade 1s don't reach. With Star Drive Dragon he forms a 28k, something that can help deplete the opponent's hand over several turns even without Force active. Both Miru Biru and Wingal are High Beasts, and so can boost High Dog Breeder Akane for 3k, making a 20k column that's just over the 18k threshold expected of rearguards. That helps compensate for his lower power base, but it's hard to advise running Miru Biru at all because of his low flexibility. ...There's not really room for Belgius in the current deck. That makes Miru Biru a challenging card to fit in, if it can fit in at all. Right now the Royal Paladin deck is still being faced with the challenge of coming up with a boss card that can stand on even footing with Dragonic Overlord, and addressing its counterblast issues. Royals currently have no way of countercharging, so in current playtesting it's shaping up as a clan that has to constantly give up one skill to use another. 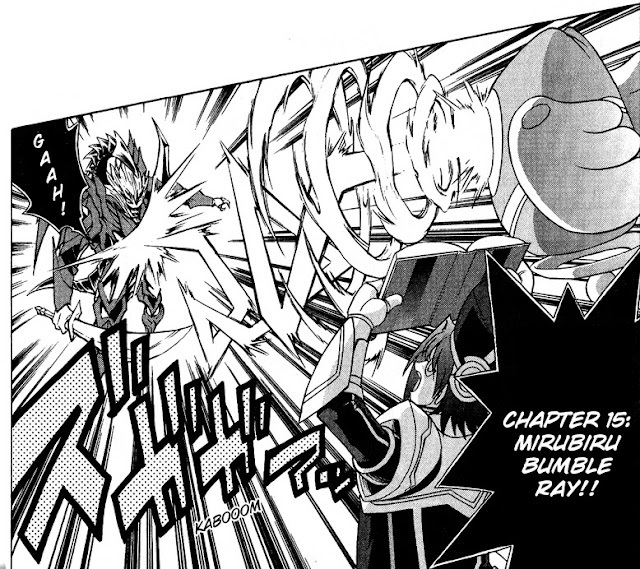 Miru Biru in chapter 1 of the Cardfight!! Vanguard manga. Among the High Beasts, it is an officer of Royal Paladin of remarkable intelligence. It is also a mascot of the knightly order, and many knights are comforted by its lovely appearance. With is high computing power and extensive strategies, it plays a central role in logistical support. Miru Biru is designed by Itou Akira and illustrated by Miyoshi Norikatsu. The previous Japanese Card of the Day was Spillover Dragon. The first Booster Set of the Standard format, V-BT01: UNITE! TEAM Q4! will launch in Japan May 25th, 2018, and in English June 22nd, 2018. It will be accompanied by V-Trial Deck 01: Sendou Aichi and V-Trial Deck 02: Kai Toshiki, launching in Japanese May 11th, 2018, and in English June 8th, 2018. They will be accompanied by a new sleeve based on the "Imaginary Gift" design. The first Extra Booster set, V-EB01: The Destructive Roar will launch in Japan June 29th, 2018, and in July for the English-speaking world. The accompanying new anime series, codenamed "Origin," will begin airing May 5th, 2018, on TV Tokyo and affiliated stations. It will be simulcast with English subtitles on YouTube and Crunchyroll.